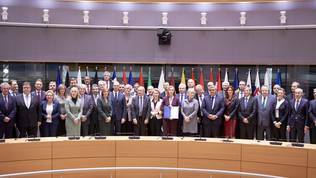 Eight years after the entry into force of the Lisbon Treaty, the EU will for the first time use one of its provisions, which lays the foundations of deeper integration in the area of defence and security - the establishment of a permanent structured cooperation in defence (PESCO). Although Protocol No. 10 of the Treaty envisaged such a step to be taken immediately, meaning in the beginning of 2010, the stars have aligned just now. And those stars are, as EU High Representative for Foreign and Security Policy Federica Mogherini (Italy, S&D) put it, Brexit and Trump. 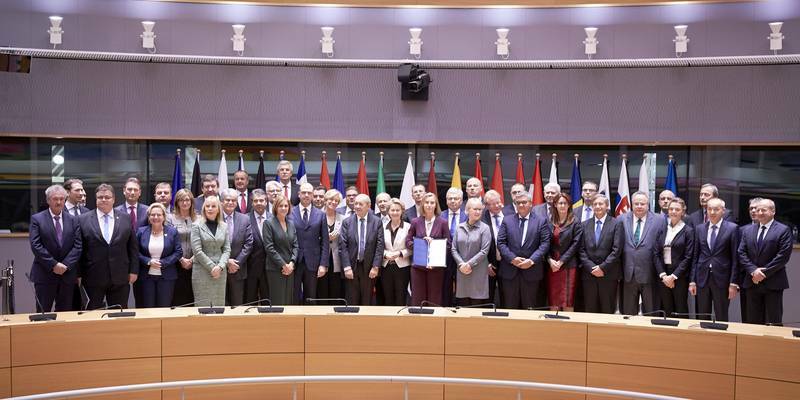 On 13 November 23 member states signed a joint notification to participate in PESCO: Austria, Belgium, Bulgaria, the Czech Republic, Croatia, Cyprus, Estonia, Finland, France, Germany, Greece, Hungary, Italy, Latvia, Lithuania, Luxembourg, the Netherlands, Poland, Romania, Slovakia, Slovenia, Spain and Sweden. The UK, Portugal, Ireland, Denmark and Malta will not take part in it. The notification brings clarity for the first time as to what exactly the permanent structured cooperation will look like and what objectives will it pursue. The notification is not just a statement of good will to participate but a document of 13 pages, which outlines the obligations of the participants, how will decisions be made, how will projects be worked upon. On 11 December, the Foreign and Defence Council will take the political decision to establish PESCO. This will be a very serious integration step in an area which has always been a taboo. The decision is expected to add some more details but the obligations will not be changed. The notification shows that PESCO is a very weird framework which strongly resembles the enhanced cooperation procedure, allowing at least 9 member states to take an integration path of their own, but it is not. It also looks like an intergovernmental agreement, but it is an integral part of the European acquis. As a matter of fact, PESCO is described in much detail in the Lisbon Treaty and Protocol 10. Its structure allows for flexibility so far unseen in any other area of strong integration - it is open both for joining and for leaving. There is flexibility within it too because the participant countries are not obliged to take part in all projects - they can choose which one to join. However, there is no possibility not to participate in any project. This flexibility is additionally strengthened by the decision-making model - via qualified majority. Despite the flexibility, the participant countries made several vows the implementation of which will be strictly monitored and there is even a possibility a country to be suspended for non-implementation. This is very important because the notification explicitly says that PESCO "is a crucial step towards strengthening the common defence policy. It could be an element of a possible development towards a common defence should the Council by unanimous vote decide so. A long term vision of PESCO could be to arrive at a coherent full spectrum force package - in complementarity with NATO, which will continue to be the cornerstone of collective defence for its members". This means that potential eurosceptic obstacles will be easily eliminated along the way. It also means that the more ambitious countries will be setting the tone. Translated from Brusselsian, this means that the idea is to pursue a common European army. The first step in this direction seems small but, in fact, it lays the foundations of a long-term vision do combine European capabilities. This can be concluded from the agreed binding commitments in the annex to the notification. The participating states oblige themselves to increase in real terms (after inflation) their defence budgets. The objective is the one set by NATO, despite that not all participants are members of the North-Atlantic Treaty (Austria, Cyprus, Finland, Sweden), which is 2% of GDP. In addition, the participant countries commit to gradually increase in the mid-term their spending on defence investment to 20% of the overall defence budget. The objective is to fill the gaps among the states in terms of defence capabilities, which will be identified through the annual coordinated review (CARD), following the lines outlined in the capabilities development plan (CDP). In this regard, participating countries commit to support CARD in every possible way. Among the other commitments are also to work for the involvement of the future European Defence Fund in multinational procurement to supply military equipment. The binding commitments are 20 and among them are also a regular review of the implementation; increased cooperation in cyber defence through information exchange, training and operational support; forces deployment in various missions. The twenty three commit also to make significant contributions to the European battle groups, binding themselves to confirm their contributions at least four years in advance and to carry out and/or take part in exercises. Simplification and standardisation of military transport in Europe among the participants to ensure fast deployment of equipment and forces is another obligation. There is also an obligation to work for common financing of military operations and missions beyond what was agreed as common costs under the Athena mechanism. To avoid a situation where a country participates in PESCO but does not take part in any project, an obligation is included to take part in at least one project which develops or ensures capabilities defined as strategic by the participants. Two levels of governance are envisaged - a Council of ministers level and a projects level. The Council will be responsible for the overall direction and the mechanisms for evaluation in coordination with the European Defence Agency and the high representative for the foreign and security policy. The foreign affairs ministers and the ministers of defence meet for joint sessions usually two times a year. During such meetings they will discuss the PESCO-related issues. When decisions are taken only the participating countries will be able to vote. New projects will be approved by unanimity, whereas the participation of new members will be approved by qualified majority after consultations with the high representative. The Council can also suspend a participant if the country does not meet the criteria (also by qualified majority). There is also a possibility to leave by filing a notification. Work on PESCO will be done just like in any other Council configuration - the preparatory bodies will gather in a PESCO-format. The second level of governance - projects - will operate on the basis of evaluation by the high representative who, for his/her part, will rely on the support of the European External Action Service, the EU military council and the European Defence Agency. The selection of projects will be done by a Council decision. Projects will be divided into two groups - specific missions/operations and projects that support missions/operations. The PESCO Secretariat will coordinate the evaluation of project proposals and the European Defence Agency will be concerned to check whether any project duplicates existing initiatives. The high representative will make a recommendation which proposals are most ambitious. The notification of the 23 explicitly states that participation in projects is open for other member states if they accept all the binding obligations and join PESCO. A Brexit-clause can be recognised in the document as well: "Third States may exceptionally be invited by project participants, in accordance with general arrangements to be decided in due time by the Council in accordance with Article 46 (6) TEU. They would need to provide substantial added value to the project, contribute to strengthening PESCO and the CSDP and meet more demanding commitments. This will not grant decision powers to such Third States in the governance of PESCO". Moreover, the Council, in a PESCO-configuration, will decide whether the aspiring third country meets the conditions. All participant countries are obliged to present national implementation plans before the Council adopts the decision on establishment of PESCO (11 December). These plans will outline the countries' potential to implement the commitments taken. All participants will have access to these plans. The monitoring of implementation will be a task for the high representative and the PESCO Secretariat. After its establishment, the national implementation plans will be updated on a regular basis. Moods were raised during the ceremony on signing of the notification. The ceremony itself was live webcast. 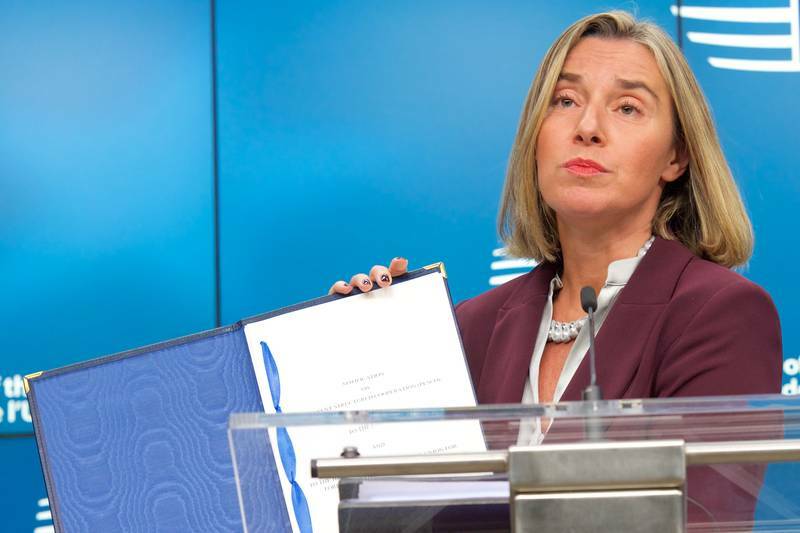 Most of the ministers of participating countries called the day a historic one, and High Representative Federica Mogherini reminded that this provision of the Lisbon Treaty is used for the first time. She added that this "historic day" was made possible by very hard work which lasted a little over a year. In the vanguard of the effort were four countries - France, Germany, Italy and Spain. She thanked them not only for this but also because "they have listened carefully to the need to open these proposals and suggestions to other Member States and make sure this was and is an inclusive process". Judging by what she said, it can be concluded that for now a balance has been found between the most ambitious countries and those who worry they will not be able to meet higher criteria. 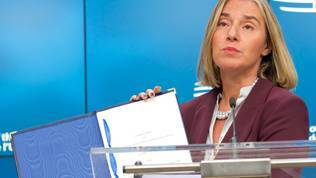 Federica Mogherini is not worried by a lack of political will to use the capabilities and instruments created in the framework of PESCO. "I have many worries, but not this one. 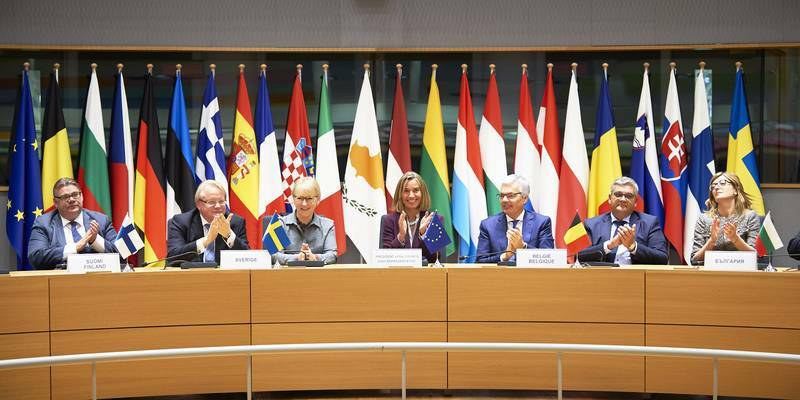 In these three years in office exactly, more or less, I have experienced one thing: the political unity of the European Union in foreign and security policy is much stronger than it is perceived, both internally and externally. We have never, not with the Foreign Ministers, not with the Defence Ministers, experienced a problem when it comes to unanimity in decision-making. On top of that, PESCO will not be working by unanimity at 28, as obvious and by definition, it is a Permanent Structured Cooperation that would be established by qualified majority voting", she added. The high representative acknowledged, however, that sometimes, indeed, there is no political will to implement what had been agreed. In the case of PESCO, there is a double insurance - an annual review of implementation of obligations and a possibility for suspension when they are not implemented. Ekaterina Zaharieva, the foreign minster of Bulgaria which takes over the Council presidency in January, said that a task force of defence and finance experts will be created as soon as possible to develop the plans and specific projects. She urged PESCO to be comprehensive and not deterring, which means to keep the door open for participation and for development of small and medium-sized defence companies. In the words of Ms Zaharieva, this is the best example to be given to eurosceptics. 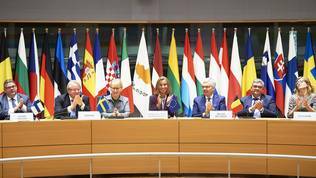 In this spirit spoke Federica Mogherini as well, who expressed hope a similar approach to be applied in other areas as well. For Bulgaria, a major priority will be projects aimed at development of capabilities for cyber defence. Another Bulgarian objective is establishing a link between defence and civil missions. The foreign minster also said that this idea is supported by most of the participating countries. Croatia, too, has prepared projects in the area of cyber defence. Minister of Defence Damir Krsticevic explained that those are projects for intelligence information exchange, drones, naval surveillance. He expressed hope that PESCO will help Croatian companies take part in more projects. More than 50 projects have been offered so far. A complete list will be published together with the Council decision in December. One of the conditions to create PESCO is not to duplicate the work of NATO, which is why there were many consultations with the pact's Secretary General Jens Stoltenberg. The biggest test for PESCO and how big an integration step it is will be the work on specific projects - how many and which countries will take part in what projects, who will have what ambitions to increase defence spending, and whether there really will be access for small and medium-sized companies from small and medium-sized countries on a market dominated by mastodons from the biggest member states. Previous euinside articles on the issue can be found here, here and here.